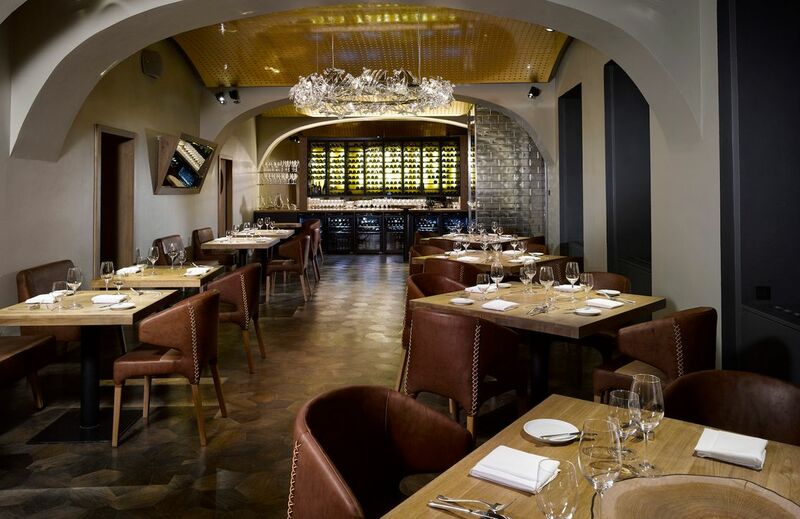 Head chef Oldřich Sahajdák's mission is to make La Degustation Bohême Bourgeoise a place of revival of traditional Czech cuisine with classic ingredients and forgotten techniques. This journey into Czech history and culinary culture is manifested in a choice of two extensive tasting menus. In fact, as the name of the restaurant would suggest, La Degustation Bohême Bourgeoise does not do a la carte nor a lunch menu. Not that such parameters made a difference to the establishment's success - La Degustation Bohême Bourgeoise is held high as a paragon of exceptional fine-dining, and bookings have to be made well in advance. Mummy and I were greeted by sleek yet cozy interiors with subtle primal elements, like the chandelier made from glass bones, brown leather seats, glass walls styled like bricks, and the wall of the open kitchen designed to look like cobblestones. 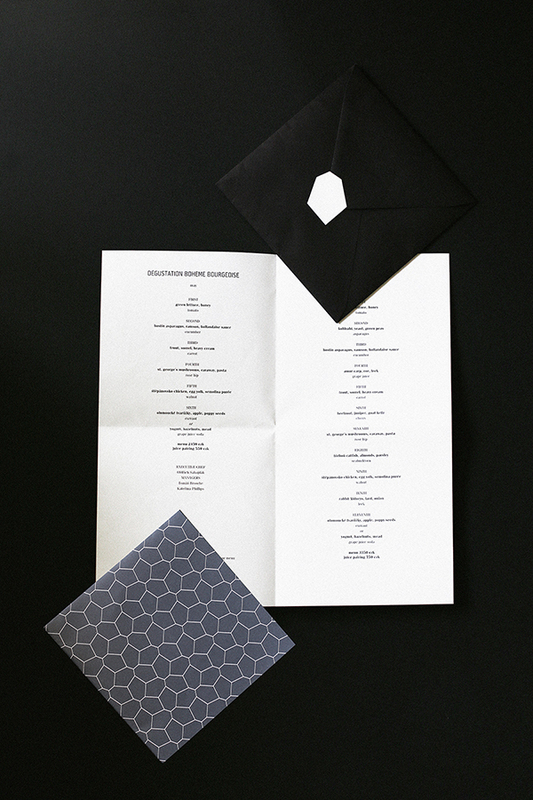 We were then presented with a black square envelope, which we opened to reveal the two tasting menus to choose from. Mummy and I opted for the smaller of the two, the 6-course tasting menu, and we chose to pair our meal with a selection of fruit and vegetable juices. We entered our culinary experience with high expectations which were met even before our tasting menu began. Dishes not included in the degustation menu, including the amuse bouche of baby radishes on an organically shaped slab of stone, seemed to be never-ending: there were also miniature jacket potatoes served on what a setup that brought to mind campfire-cooking (a wire grill stretched over a tin can in a bed of pebbles), an assortment of crisps and wafers on a bed of hot rocks, a couple of quails eggs (along their perfectly hollowed out shells) plated in an egg carton, and a tiny steak tartare sandwich between two paper-thin wafers. And all of this before a 6-course tasting menu! It was certainly generous, and made me look forward to the main event. So you can imagine my understandable consternation at the first course: an extremely deconstructed salad, which was literally a small head of green lettuce, stalk and all, drizzled in honey and garnished with edible flowers. 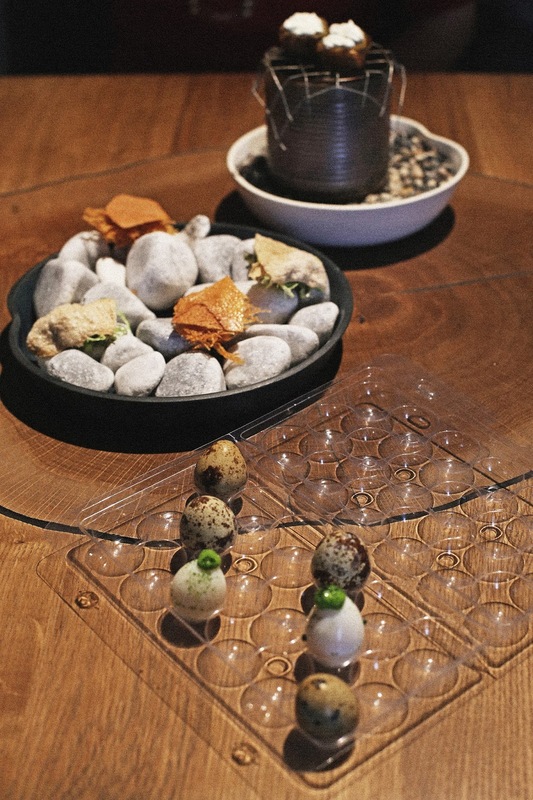 The dish was extremely minimal and seemed to lack the attention to detail of our pre-tasting menu starters, especially when compared to the trio of quail's eggs, jacket potato, and wafers on rocks. The second course fared better: a juicy, almost obscenely thick stalk of Hostin asparagus served with hollandaise sauce. Now, I love both asparagus and hollandaise sauce so I enjoyed this dish, but I couldn't say the same for mummy (she's not a fan of asparagus) who was thus far unimpressed. Unfortunately, the odds of my enjoying the third course were stacked against me: I don't like eating cooked fish (with the exception of black cod with sticky miso-marinated skin) so the trout with sorrel and heavy cream was wasted on me. I had far better luck with the fourth course. As the parcel of pasta stuffed with St George's mushrooms passed my lips, I nodded approvingly towards mummy, who despite not being over the moon, was reserving judgment. I have to say that the young American couple at the table beside us were as perplexed as we were - they were a course behind us, so we had a slightly-delayed running commentary on the tasting menu, which was essentially an English version of our Mandarin conversation: "We're not going to fill up on this...should we order a pizza for later?" although the Americans were somewhat more lubricated, having opted for the wine pairing rather than our juices. Speaking of which, I must applaud the daring move of introducing fruit and vegetable juices to a tasting menu - whatever my opinions of cucumber as a drink or the tartness of the tomato juice, they did complement the flavour palate of the dishes. Mummy commented drily, referencing our upcoming 'green juices only' detox in Chiang Mai: "Well, it's always good to have a head start". The fifth course provided another head scratcher, or rather my struggle to reconcile sight, texture, and taste. The Stepanovsko chicken with egg yolk and semolina puree was actually rather tasty, but the pink, almost-raw appearance of the chicken made me squirm, while the miniature egg looked like a Haribo sweet which I actually rather quite enjoyed! ...YOGURT PAIRED WITH GRAPE JUICE SODA. Happily, our rather hit & miss dinner ended on a sweet note, both literally and figuratively. The tasting menu offered a choice from two puddings, and we went with the second: a yogurt blended with hazelnuts and mead, served with a grape juice soda. The pudding was rather like a dense yet light, creamy mousse and oh-so-satisfying, while the paired grape juice soda was a nice blend of sweet, zesty, with an amusing amount of bubbles (BUBBLES!). Dessert rather brought out the inner child in me, although mummy was rather less impressed - I could hear her chuckling: "All this fancy Western fine-dining still doesn't compare to a hearty, good old-fashioned Chinese meal..."
FOR PETIT FOURS, A FIG-LIKE SWEET. My final thoughts on La Degustation Bohême Bourgeoise? The obvious elephant in the room is that my experience was very hit & miss, and it would've been absolutely disappointing if it not were for the jokes and banter about how we must clearly be Luddites because we "didn't get it". The menu, as is head chef Oldřich Sahajdák's goal to revive ye olde Czech cuisine, has to be lauded for its imagination, intent, and presentation but the fact is that we simply did not love the May Degustation menu, especially after the creative and delightful starters that weren't even on the tasting menu. I'd have liked to see more substantial meats, like pork or beef or venison, on the menu, and more options for those who don't eat cooked fish. That said, the menu is generous in its size, especially when you consider than even with the smaller of the degustation menus you get an additional 6 dishes (including amuse bouche and petit fours). All of this was fairly priced too, coming in at just under £200 for 2 people. I insisted on paying: "Happy Mother's Day, now let's go get some Chinese! ".